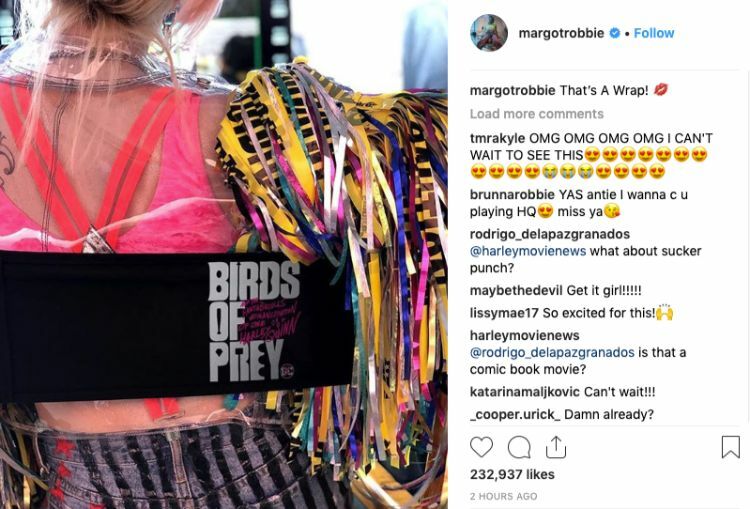 Oscar-nominated actress Margot Robbie took to Instagram earlier today to share the news that Birds of Prey (and the Fantabulous Emancipation of One Harley Quinn) has officially wrapped filming, which means were are now one step closer to seeing her make her trimuphant box-office return as the iconic bisexual antihero Harley Quinn. "That's a wrap!" Margot captioned an Insta photo of her sitting on a director's chair with the Birds of Prey logo emblazoned on the back. As we've previously reported, Birds of Prey is an upcoming DCEU film about Harley Quinn and her squad of kickass superheroines, the likes of which include Black Canary (Jurnee Smollett-Bell) and Huntress (Mary Elizabeth Winstead). Ewan McGregor and a platinum blonde Chris Messina are also set to star. The film has been a passion project of Margot Robbie's for some time now, and will be directed by Cathy Yan, the first Asian woman to direct a major superhero film. Birds of Prey (and the Fantabulous Emancipation of One Harley Quinn) is set to hit theaters on February 7, 2020! Watch the cast teaser in the video below!